Christmas is not a surprise. It’s on the calendar and we know months ahead of time when it’s coming, but somehow I always find myself scrambling at the last minute to finish baking, grocery shopping, buying and wrapping gifts, or sending out Christmas cards. This time I really was not on the ball and mailed cards on Christmas Eve! Every year I promise myself that I will be better organized next year, and I will try, of course knowing that there will still be some last minute dashing about to pull it all together. I’m not even going to bother making a New Year’s resolution for that! Sugar cutout cookies from Elise at Simply Recipes. We made pumpkins for Halloween and many festive shapes for Christmas. 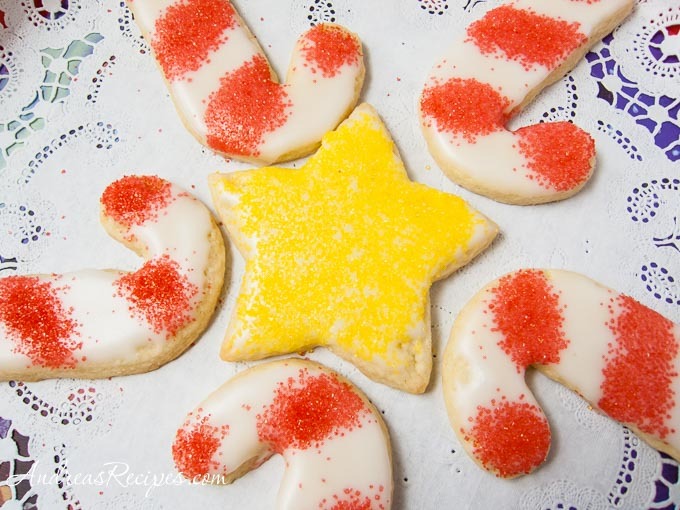 We dipped our cookies in the white sugar icing then sprinkled colored sugars and multicolored nonpareils on top, something I find much easier than piping decorations. Easy is important when you have two preschool-age assistants and a toddler pulling on your pant legs! The boys were able to help throughout the process, which made it even more fun for them. We did not color the icing this time, though I would certainly do that the next time we make them, probably at Easter. They will make some very pretty Easter egg cookies! I think you will really enjoy your Pizzelle maker. My parents have one. Every year we go home there are Pizzelle Cookies sprinkled with just a little powdered sugar on top – and mmm they are good. I received a pizelle maker for Christmas, so I’m so excited! Your cookies all look wonderful. Congrats on your new pizzelle maker, Deborah! You’ll have to post pics of the cookies you make! 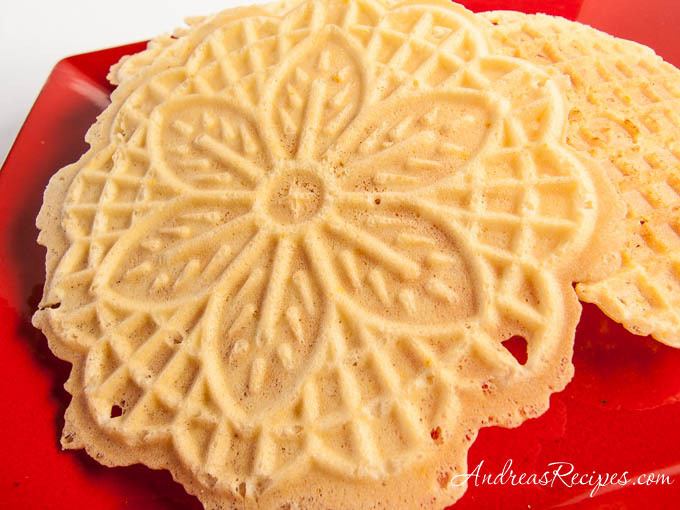 Hi Andrea, I came across pizzelles just now, over the holidays with the blogs, and I cannot find here the pizzelle maker, too bad, they look so yummy and their shape is so cute. That’s the best xmas present I’ve come across, hands down. I adore pizzelles. In fact, my dad submitted them to my cookie event, and sent us some from RI. Even after the nearly 3000 miles journey, they were scrumptious. Have fun! Cris, Maryann, and Susan: I LOVE the pizzelle maker! The cookies tasted wonderful. Thanks for the recipe, Maryann! I came to you from a search for a benne wafer recipe…got it, thanks! I am now a new fan of your site…I stayed and looked around trying to find the recipe for the cookies in the picture in your header…they look like they may be shortbread with red fruit ( cherries or cranberries?) in them, and appear to be half dipped in white chocolate or white fudge. I searched for quite a while, would you be willing to send me the recipe?